It says a lot about the desirability of the Eee PC that a couple of new colours really does seem to constitute a genuinely exciting news story (or maybe I’m just drunk on tiny laptop goodness). The cherry red 901 and the purple 900XP models don’t appear to offer anything extra other than their colour. The 901 comes with an Atom processor, Draft-N wireless and 12GB storage while the 900 has 16GB SSD storage, Wireless G and a 4-cell battery. 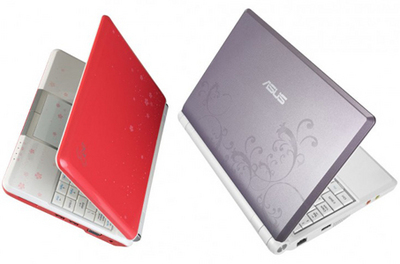 Other than that, they both come with 9-inch screen, 1GB of RAM and Windows XP. Absolutely love these little machines! I am UK based and have been having real trouble getting my hands on a 901 or 900 that isnt plain white/black, so frustrating!!! The variety of colours is one of my favourite parts about them! But yeah stunning little portables and the two new colours just add to my longing!